In record time the government acted on allegations of corruption this morning. A story published on a Spanish newspaper at 5 am this morning said Andreina Fenech Farrugia, until then Director General of the Fisheries Department, solicited bribes to allow “fish laundering”. That’s allowing a tuna company (the one we know of) to fatten more tuna in off-shore cages in Maltese waters than European law allows. And making some 25 million euro a year of illegal profits in the process. At 09:50, Times of Malta reported Andreina Fenech Farrugia had been suspended. Times of Malta’s Ivan Martin had already tweeted news of her suspension at 09:45, which means the decision to suspend her was taken at most in the space of 4 hours and 45 minutes after a website published allegations. Malta govt sources confirm that fisheries dept director has been suspended following Spanish media reports of alleged corruption in Tuna racket. New acting director to be appointed today. Not that her position was tenable. But this is a country where Konrad Mizzi is still exactly where he was when three years less 10 days ago, a website published allegations about his corruption. And much more has been published about him since. Here is what Silvio Camilleri eloquently described as the rule of delinquents. Andreina Fenech Farrugia’s appointment to the Fisheries Directorate was a mess, to begin with. She was already fired one other time from the job. That was November 2011 when the Fisheries sector was in an execrable mess and she was replaced in the post by veteran civil servant Joe Caruana. 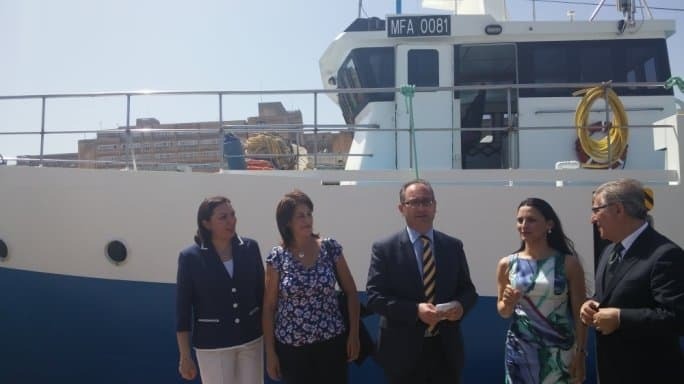 That was after the EU director general for the sector Lowri Evans warned local authorities that continued administrative shortcomings (under Fenech Farrugia’s tutelage) would likely mean the end of the Maltese fisheries sector. But when Labour came to power and Roderick Galdes, for reasons that escape any logic or reason, was made fisheries Minister, he kicked Joe Caruana out and brought back Andreina Fenech Farrugia to the post she had already been thrown out of. This morning’s Spanish press report says that it is a thinly veiled secret that Malta’s waters are a pit for “fish laundering”. Significantly the EU’s commissioner for the sector is Karmenu Vella. And if “rumours” had reached Brussels about what was happening in Maltese waters, the same rumours should have surely reached Malta’s own government. The quick dismissal of Andreina Fenech Farrugia reminds us of another reality that corruption at the very top of our government has created here. If the guys on top — Konrad Mizzi, Keith Schembri, perhaps Joseph Muscat as well — get away with it, why shouldn’t people in lower ranks of power? That is the unspoken arrangement that has propped up the people on top in spite of all the revelations about them. They were kept in place with the support of others who were also corrupt or wanted to be corrupt. But when Richard III stopped paying the Duke of Buckingham, the party turned sour. And all the king’s horses and all the king’s men could not put him back together again. UPDATED: Trust me, he pleads.